Pooh has his jack-o-lantern and we have one, too. 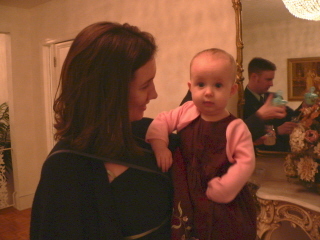 although I'm not sure she knew what to make of it at first. 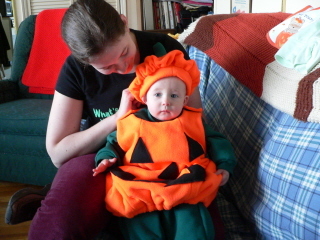 Yes, it must be a tad disconcerting for a 9-month old to suddenly find herself dressed as a pumpkin. But, as children do, she just went along with the crazy adults in her life. The surprising thing for Kelly and me was that she kept the hat on the whole day. 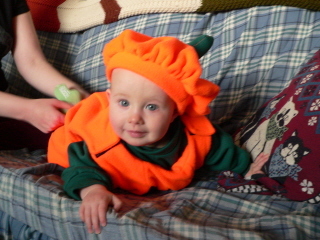 Even as we were out trick-or-treating (which really seemed to confuse her), she never pulled it off. 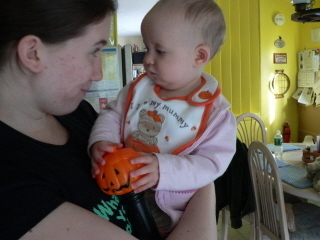 She was quite fascinated with Nana's pumpkin turned jack-o-lantern. 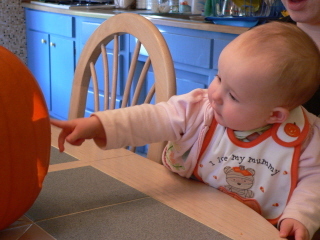 This is about as close as she could get, since there's a candle inside. 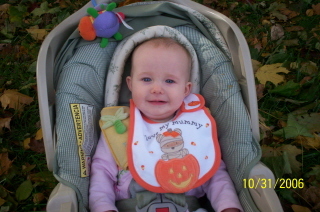 By the way, her bib says "I love my Mummy". Nana and Grandpa gave Lorelai this safety flashlight. You know, just in case she might decide to go take a walk by herself at night. You never know, right? 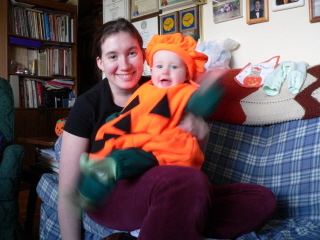 Years from now, she'll probably look at these pictures and say, "You dressed me as a what?" This is cute, Lorelai among the autumn leaves. She had a fun day! And the weather was quite nice, as well. Ta-ta, hope your day was fun! Halloween tomorrow and I have plans to do things like I did when my kids were little. I've missed all those little traditions we used to have. 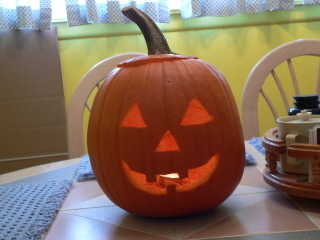 I plan to make the jack-o-lantern and use the insides of the pumpkin to make pumpkin pie. I might even make cupcakes, too. Lorelai can't have it yet but she will someday. It appears it will be fairly warm tomorrow. I hope the costume isn't too warm, now. My intermediate class starts tonight. I don't have the materials but I'm hoping they have them there for me tonight. I plan to set up a review lesson for tonight. I think they'll all appreciate that anyway. I think they're a little nervous about starting right in without a review. I'm also working on the Sunday script today. 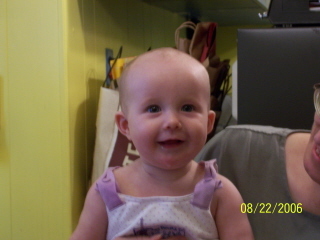 Lorelai isn't on stage but she is in the slide show as Baby Marie. Her first credit. How cute is that? 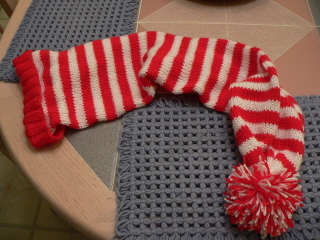 Yeah, no connection, except that I finished the stocking cap on the train while traveling home from the theatre. Isn't this cute? 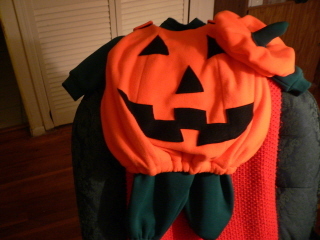 Except for the ribbing and the pompom (obviously), this had to be done on the machine because it's for Kim's friend to wear for Halloween. She's one of the Rice Krispie guys, Crackle, I think. I had fun making this. 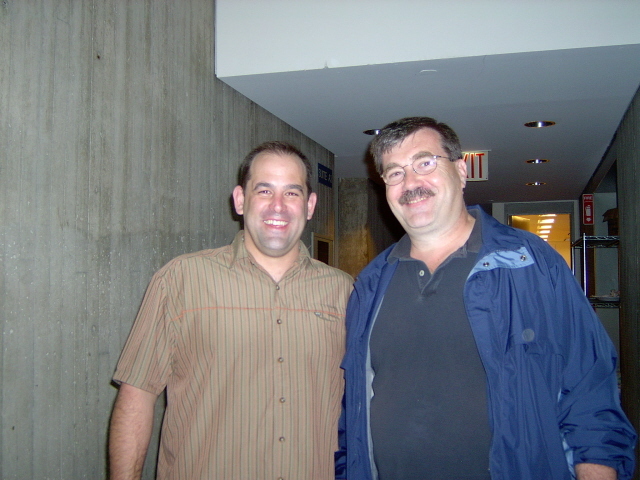 Last night, I saw my friend, Stephen Hope, in the play Ascension. This is by far the best thing I've ever seen him do. It's a fascinating play that leaves quite a bit up to your own interpretation. 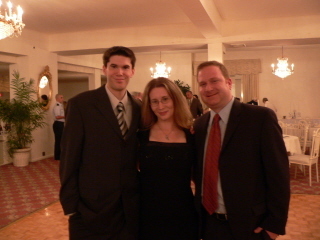 Jan, Eric and I went together. Eric and I came out with the same idea and Jan thought the opposite. When we talked to Stephen about it, his response was, "I don't know, did he? What do you think?" Thought-provoking theatre. Halloween is next week. It's exciting to have a little one around again. Although, she won't understand anything that's going on now, she will in years to come and that's fun to anticipate. By the way, Lorelai is 9 months old today. Time flies! 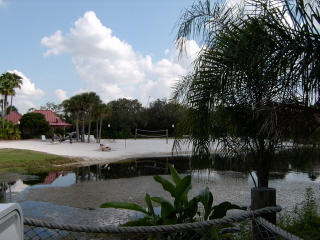 Now that I'm getting more organized, here are some pictures from the Caribbean Beach resort. This is the building our room was in. 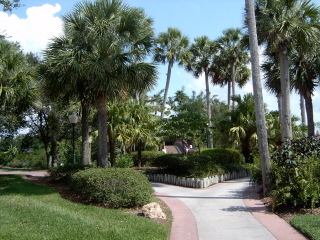 The pathway to the bridge that leads you over the lake to the pool, shop and food court. Last night and today I'm doing some shopping to replace lost items from the trip. On Sunday, after the flight was canceled, we picked up our baggage and the front zippered pouch on my suitcase was ripped open. A bag was missing, the one with all my most expensive toiletries. I was so upset. I didn’t even have deodorant for the next day. Then when we arrived home in NY, I discovered the lock had been broken and the bag opened and inspected. It just creeps me out that someone was searching through my bag. Thank goodness, everything was still inside, including all the gifts I had for the family. Also, in Orlando, as we went through security on Monday morning, I had an argument with the TSA agent over my ziploc bag in my carryon. I had the few things I needed and all were smaller than 3 ounces but my bag was larger than a quart bag so the woman said I'd have to go back to the beginning and buy a quart size bag. You've got to be kidding me. After all that had happened, I just wanted to go home. We'd been on line probably about half an hour and I didn't intend to go back to the beginning again. I wasn't backing down. She took out my hand lotion and hand sanitizer, both of which were almost empty. She said if I wanted those things, I'd have to go back for the smaller bag. She said she couldn't take the other things I had (lip balm, blistex, etc.) because those were considered medicines. So I told her to dump the lotion and hand sanitizer and went on my way. It wasn't worth it, you know? Meanwhile, I'd gone through security in NY and in Orlando on Sunday and no one ever mentioned anything about the size of the ziploc bag. It was just petty. Bill said, "You've lost a lot of items on this trip." It was unnerving. Again, I say, next time let's drive, shall we? We arrived home yesterday afternoon after an uneventful trip consisting of two flights. Thank goodness! We took a 9am commuter flight from Orlando to Miami, a trip of about 40 minutes. We arrived in Miami at gate 5 and were due to take off an hour later at gate 7, which turned out to be right next to 5. Finally, some good luck. Bill checked with the ticket agent to see if he could seat us together, since our seats on the Miami to NY flight were three rows apart. The ticket agent assured him we'd be able to sit together and gave us the first row in coach. As we were sitting, watching out the window, the plane arrived and our ticket agent guy (nice guy, don't know his name) went through that tunnel thing (don't know the name of that, either) and down stairs to the plane and started guiding it to the gate! Bill said to me, "Look, the same guy is guiding the plane." He then came back up the stairs, got a wheelchair and brought a passenger off the plane. Then, he came back to the ticket podium. This guy does everything. Of course, as we're watching, Bill said to me, "Look, that guy's refueling the plane, too." When I looked, he said, "Gotcha". Well, we're sitting there and the ticket agent came over to me and asked if he could have the boarding passes. I handed them to him and he crossed off the seats and said, "This is really high tech, these are your new seats." He upgraded us to first class because he felt so bad that we'd gotten stuck coming to Miami to get home. It was so nice. First class seats are so much more comfortable and the flight attendants were very attentive, even though you only get soda and a bag of chips. One flight attendant asked us if we needed anything, and then said they had heard about our problem. I said, "You have?" He said, "Yes, the ticket agent told us." So, we were the celebrities of the plane, I guess. Anyway, we're home safe and sound. 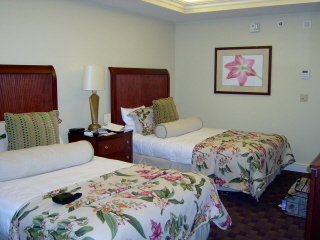 The room at the Hyatt hotel built above the Orlando International Airport. Pretty, right? A picture is worth a thousand words. Yes, this is quite a bathroom. 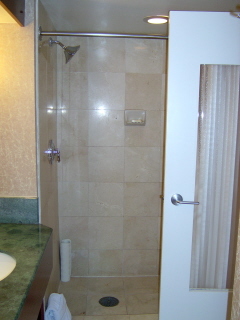 The shower. There was no bathtub. 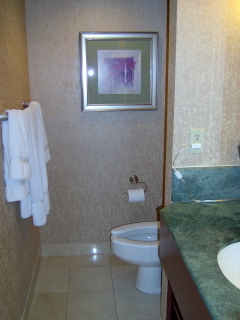 Believe it or not, there's a phone on the wall to the left of the toilet. A phone. Wow. There was a balcony outside this tenth floor room where you could watch the planes taking off from the airport. 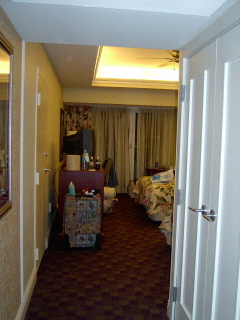 Incidentally, this room was next to the Lindbergh Suite. 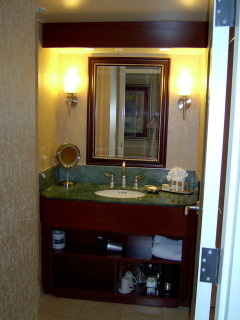 The suite had two doors. I was wishing I could get a look at it. 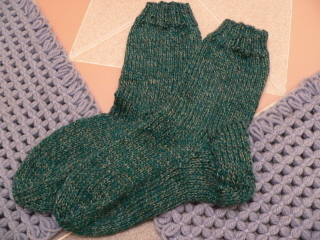 I finished the second green sock on the trip, mostly on the plane trip down to Orlando. They turned out really nice, I think. I'm now finishing up the heel gusset on the second of the pretty blue and purple socks. I did a lot of work on that one on Sunday and Monday, either waiting for a plane or on a plane. Prime knitting time. I love the tweedy look of the green socks. These are all wool, so I have to be really careful when I wash them. A blustery and chilly fall day. I think it's supposed to get down to the 30's this week and then warm up a bit. I really hate the idea of getting the winter coat out already and I have to get used to this weather after a few days of 90 degree temps. One extreme to the other. 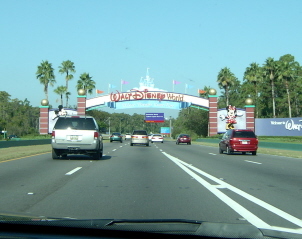 Let's begin by saying that the next time we take a trip to Disney, we'll drive! Our flight was due to take off from Orlando at 3:15. We dropped off the rental car and were sitting at the gate at 1:15. After the flight arrived from LaGuardia, there was a mechanical problem discovered on the plane. First, we were told the flight was delayed until 4pm while they repaired the problem. After promises of 4:30, 5:30, between 6 and 6:30, we found out that whatever needed to be fixed was behind the galley, which would have to be removed. Hmm. Apparently, the maintenance guys were going to try to do a quick fix but the captain wouldn't sign off on that. I was actually grateful for that. And I thought going through security was stressful. So, the flight was cancelled and the next flight we could get was 9am today. It's a commuter flight to Miami, actually. We have to go to Miami and then fly to LaGuardia. I'm not a happy traveler to begin with so that's why it's 3am and I'm still awake. The airline put us up in the Hyatt Hotel, which is built right over the terminal so we didn't have to go far, just up the elevator. The room is amazing. I took pictures. Really. The bathroom is beautiful. I'm just tense because I should have been home by now. Sigh. We had a great time at Disney World but the next time? We'll drive! See you real soon! We had a great time but it's time to go back to what seems to be cold weather. It will be a shock to us. It's been around 90 here, really hot and humid. Here's a brief wrap up of our trip. 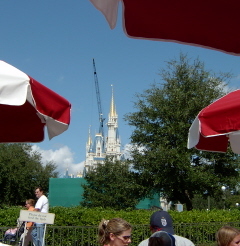 I'm not sure if you can see this but they are painting Cinderella's castle. It's a bummer for people who've never been here and want that obligatory picture of the castle from Main Street. I have many pictures of the castle, of course. This is hard to see, too, but this was at Downtown Disney. 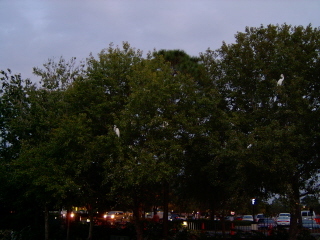 The swans were in the trees, possibly to go to sleep? It was a little weird. On Friday evening, we went to the Chinese pavilion at Epcot for dinner. It was so good and the restaurant was really pretty. 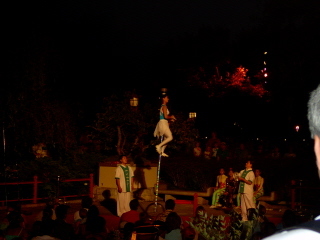 After dinner, we watched a show of Chinese acrobats. This girl balanced on this tall unicycle and flipped bowls and even a spoon from her foot to her head. Amazing. There were also little girls, couldn't have been more than 10-12, who tumbled and kept fabric circles twirling on their feet and hands. 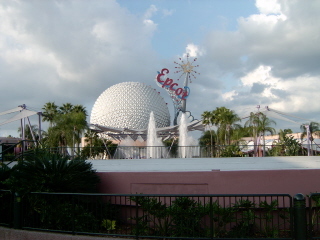 Yesterday, we spent the day at Epcot, aka Experimental Prototype City of Tomorrow (or "Every person comes out tired"). We haven't spent much time there on our recent trips and there were some new attractions. So, we were able to see things we hadn't seen before. When Kelly and I went to California Adventure, our favorite ride there was one called California Soarin'. It's a huge Imax movie, which usually makes me feel kind of woozy, but in this ride, they fly you around like you're hang gliding and you move with the movie. It's so cool. They have this ride here in Epcot now but it's just called Soarin'. We did fast pass for this. It was great. 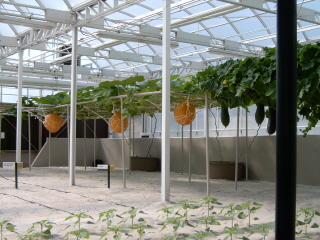 We also saw a Circle of Life film about conservation and went on a boat ride through the greenhouse, which was very cool. 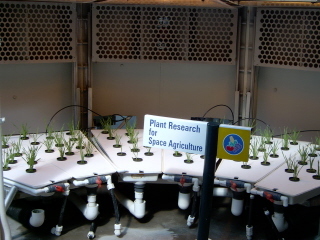 They are developing new ways to grow food. 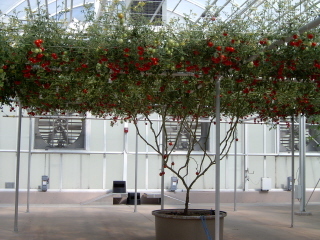 All these tomatoes from one plant. This pumpkin is going to have Mickey Mouse ears! 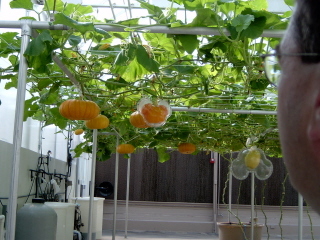 How can we grow food in space? Aren't these cute? 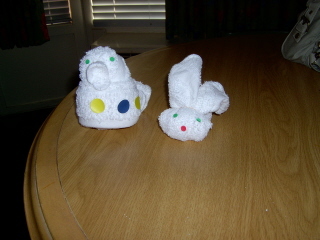 Our housekeeper (or "mousekeeper") made them from wash cloths. A duck on the left and bunny on the right. 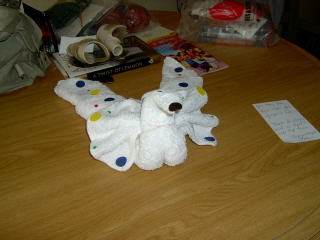 I think this is a swan. 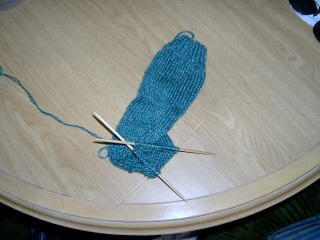 And, yes, I did some sock knitting, too, although this is so not the color of these socks. They're green. I finished this one last night to make one more pair completed. So, it's time to pack up the stuff (and all the goodies I bought!) and head home. Ta-ta for now and see you real soon! Greetings from Walt Disney World! 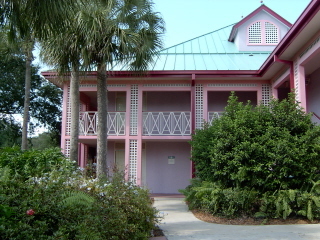 Bill and I are on vacation and staying at the Caribbean Beach resort at Walt Disney World. We arrived yesterday afternoon and after a dip in the pool, we immediately went to Downtown Disney to walk around. We planned to go to Rainforest Cafe but it was so crowded. In fact, everything was crowded. We had hoped that since school is now in session, it would be a little less populated. Although the parking lots at Magic Kingdom were not as full, all areas still seem to be quite busy. In fact, at Downtown Disney, I often felt like I was in midtown Manhattan. Luckily, I'm skilled enough to get around the slow-moving pedestrians. Move people! Don't you know I'm heading for Pooh Corner!? Our room at this resort is on the first floor and a very short walk from the parking lot. This is very different from our stays at Coronado Springs, where everything was a walk, a REAL walk. We're also not far from the theme pool, shops and food court. This is good because it's hot! It's 90 degrees right now. What's up with that? It's not August, it's October. Ah, well. I hear at home it's in the 60's and cloudy. I shouldn't complain. We went to Magic Kingdom this morning and immediately headed for Pirates, our favorite ride. The last few times we were here, we just walked onto this ride. But since the release of the movies and the changes to the ride (Jack Sparrow is a part of the ride now), it's popular again. So, we waited about 25 minutes and when we were at the very front of the line, as in, next to board the boats, the ride broke down. After about ten minutes, in which time we were assured it would run shortly, they told us we'd have to leave the same way we came. So close! As we left, we were all given passes to return without waiting. So, we went to the Tiki room, which is right near Pirates, and then went back to check if it was running again. It was and we were brought through the handicapped entrance and right on the ride. It's definitely different and fun, especially the illusion in the very beginning, which is really cool! You see the boat a little bit faster than before and you see Jack Sparrow three times throughout the ride. After lunch, it was back to the hotel for a swim and now we're getting ready to eat dinner at Epcot. More tomorrow, maybe some pictures. Yep, a twisted, tangled mess. 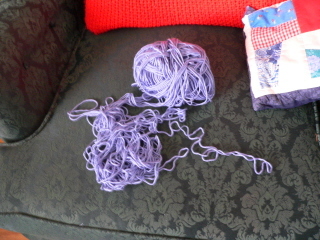 I wasted so much time trying to untangle the mess when I could have been knitting. This picture, however, is a little closer to the actual color. I also made a long panel for a shawl for me. I used some lovely cream (natural) color wool. 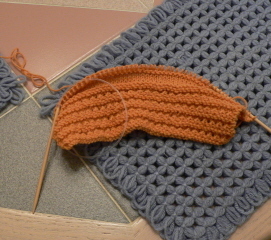 It will be done when I finish doing the crochet border around the outside. With all these other projects, I've had to put the socks and the cardigan aside for a few days and I'm itching to get back to them. Although the sun is trying to come out, it rained quite a bit last night and still looks threatening. It's so cute! We tried the jumpsuit on her to see if it fit. It's a little roomy but the length is good so it should be fine. 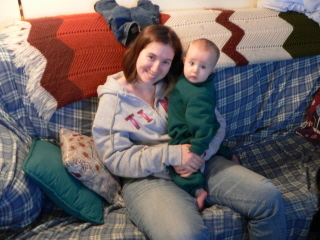 It's really nice, warm sweatshirt fleece, so she shouldn't need a sweater on Halloween. I really love the hat. She probably won't wear it (hopefully, we get a picture) but she'll have fun playing with it. Here's another picture from the summer time. 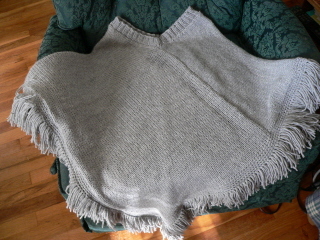 I'm almost done with a poncho for Kim. I just have to finish the fringe. I should have it done tomorrow morning. 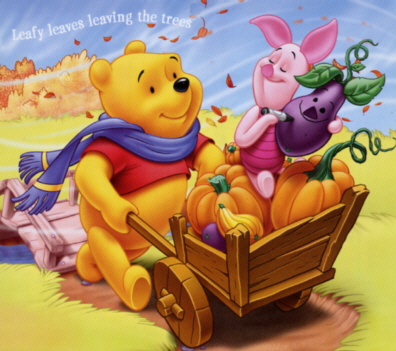 Pooh and Piglet are pumpkins for Halloween, too! Bill and I went to the Digital Life show at the Jacob Javits Center today, a show of all things tech-related. I found out about some sites I'd like to check out, particularly one that will give you 25 gig of digital storage online. I plan to check that out as a place to post video of Lorelai, so others can see it. Big pictures! They're sized for email, not the web. From there, we went to eat dinner at a small (and I mean small!) Italian restaurant we happened to see called Mario's. It was delicious! We lucked out and got a table right away and it filled up considerably after we left. 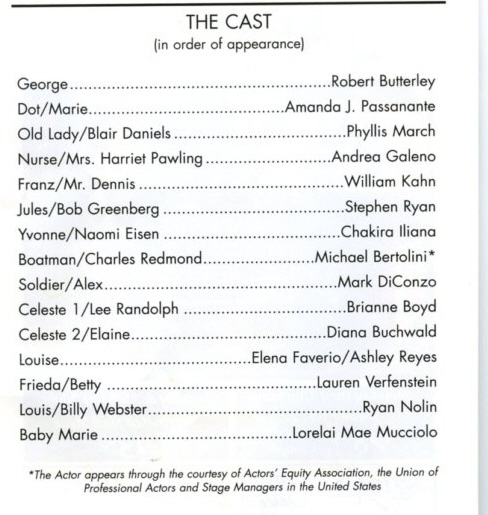 We're going to see Arsenic and Old Lace tomorrow afternoon, the closing performance. I can't believe that run is over so quickly. Wow, four weeks flew by so fast. Sue and I interpreted the show on Thursday and I was so tempted to turn around and watch, it sounded so funny. 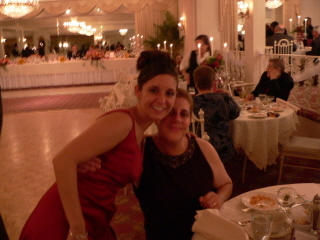 Interpreting it was SO much fun! Our deaf audience enjoyed the play as well. It's really funny and the performances are great. I didn't want to miss it. 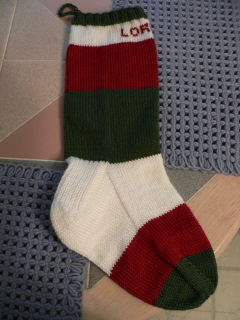 Just off the needles and all ready for Santa to fill it. I will make a stocking for her to have at Nana's house but first, I have to sew her Halloween costume. First things first, as holidays go! Halloween's not far off. This is from Kelly. 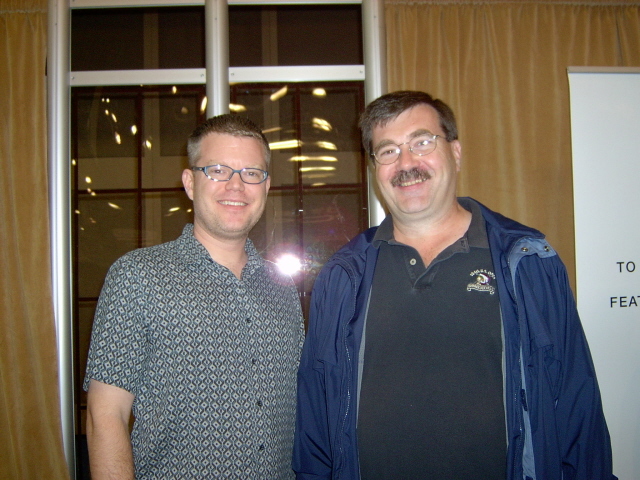 Chadd and Dennis are starting rehearsals for A Christmas Carol. You know the scene where the children are singing Christmas carols outside Scrooge's office and he chases them away? One of the children is supposed to yell back at him, "You wicked old screw!" The director told the child, "Now, when you run away, I want you to say your line loud and nasty." They do the scene and the kid yells, "LOUD AND NASTY!" I love it. It looks like it wants to rain out there but can't make up its mind. Anyway, I'm off to make dinner. It was a struggle getting there with traffic, which was compounded by the rain, but we made it. 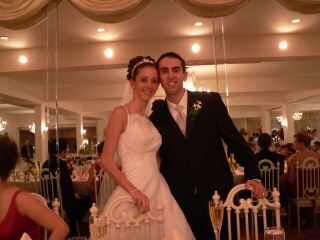 It was a beautiful ceremony and reception. 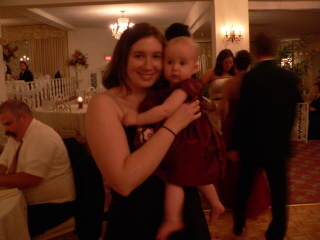 Lorelai was wearing her burgundy dress and little pink "shrug". She looked very fashionable. 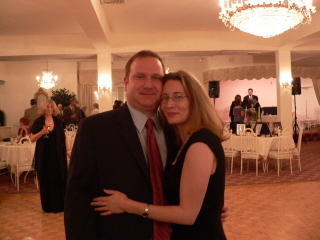 Of course, as the evening wore on, she was no longer wearing her shrug...or her shoes and tights. She was the cutest thing and a hit with guests. Some nice mood lighting there, right? I try not to use the flash unless I really have to. Most of the time, it's ok and the lighting is softer without the harsh flash. I lightened these a little without changing the coloring too much. 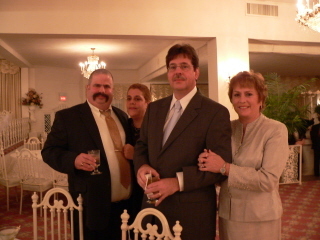 It was great seeing Sue and Marty and John and Cheryl. We're all so spread out these days, we rarely get to see each other. 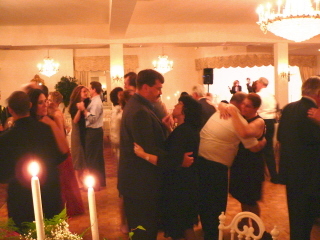 It's great to have a happy occasion like this, bringing everyone together. 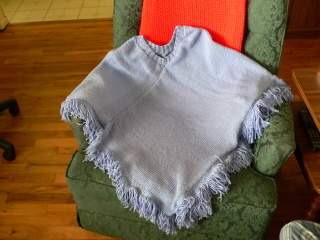 Kelly's poncho. I made the two panels on the knitting machine in two hours. I seamed it with crochet slip stitch, picked up the neck stitches and knit the ribbing on a circular needle, did a one inch crochet border and fringed it. That process might have taken another two hours, maybe a little more. It's a really pretty gray heather. Considering the time investment, I might just have to make one for myself. 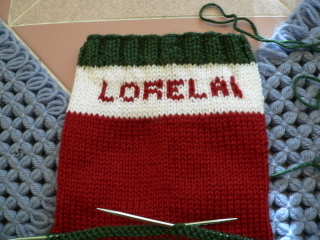 Lorelai's Christmas stocking. 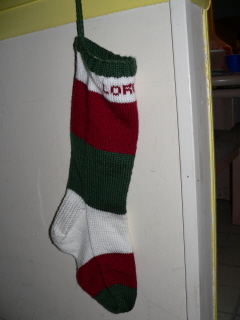 I'm loosely modeling it after the stockings my kids grew up with. Other than that, I'm using a pattern from a book as a guide. I have a plan up to the heel. After that, I'll see what I want to do when I see how it looks. So far, so good. This alphabet is from the book, Christmas Stockings, the book with the pattern I'm using. It's essentially a big sock. I can do that. The weather report for the day is....ok. It's sunny but it's still a bit humid. Actually, I should appreciate this weather now. Soon enough, it will be cold and I will be whining. That's inevitable. It's October and we're starting this month off with rain and chill. Soon, we'll be pulling out those scarves, gloves and mittens and warm things. The season premiere of LOST is this Wednesday. I just finished watching the DVDs for the second season Friday night so I can't imagine what it's been like for those who waited since the season ended, whenever that was. After the last scene ended, I literally said out loud...to no one.... WHAT?? I have no idea what the heck happened. And if this show runs true to form, I might not know at the end of the first episode, either. 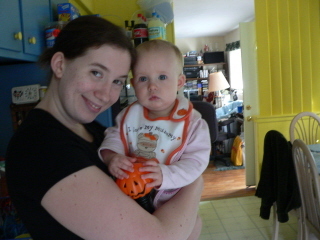 Babysitting for Lorelai today. We're planning to go food shopping and then meet Kelly for dinner after she's done at work.